OBJECTIVE: To learn how a formula describes a compound’s composition. A compound is a distinct substance that is composed of the atoms of two or more elements and always contains exactly the same relative masses of those elements. The types of atoms and the number of each type in each unit (molecule) of a given compound are conveniently expressed by a chemical formula. In a chemical formula the atoms are indicated by the element symbols, and the number of each type of atom is indicated by a subscript, a number that appears to the right of and below the symbol for the element. Write the formula for each of the following compounds, listing the elements in the order given. Each molecule of a compound that has been implicated in the formation of acid rain contains one atom of sulfur and three atoms of oxygen. 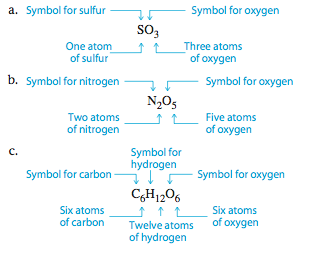 Each molecule of a certain compound contains two atoms of nitrogen and five atoms of oxygen. Each molecule of glucose, a type of sugar, contains six atoms of carbon, twelve atoms of hydrogen, and six atoms of oxygen.